Sometimes a situation calls for a soundtrack. For Southwest Airlines, that song could easily be the recent hit “Happy” by Pharrell Williams. 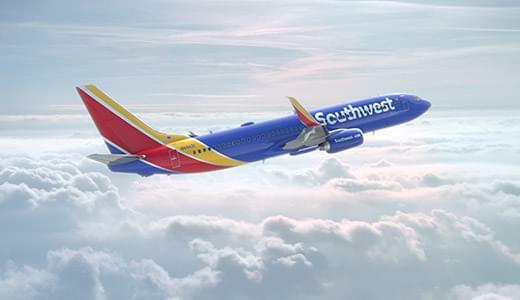 A new study from the U.S. Department of Transportation (DOT) revealed that Southwest Airlines has the happiest customers among air carriers. That stat is truly impressive, as the latest DOT report states that passenger complaints spiked a hefty 20 percent in the first half of 2015, even as the overall performance by airlines showed a marked improvement. It also came as Southwest witnessed an increase in air traffic. The key complaint among all air travelers during the first six months of 2015 was the skyrocketing cost of flying. To be sure, the number of flyers upset about rising airfares nearly tripled this year compared to the first six months of 2014. Still, the number one gripe among passengers was the typical frustration over flight delays and cancellations. Between January and June of this year, those types of grievances surged to more than 3,100. That’s a notable 15 percent year-over-year increase. Those complaints occurred despite the fact that 78 percent of flights arrived on time during that time span, up from 74 percent in 2014. Cancellations, meanwhile, slipped to 2.2 percent from 3.1 percent. The DOT’s data comes with a footnote. It does not include the delays, cancellations and complaints stemming from United Airlines’ mid-summer glitch, which caused a string of headaches worldwide. All United Airlines flights were grounded for more than two hours on July 8 because of a computer hardware problem. United, the fourth-largest U.S. carrier, was forced to delay 800 flights and cancel 59. The DOT’s study also showed an uptick in complaints about airlines’ customer service, refunds, overbooking, mishandled bags and advertising. Among other findings in the study, Spirit Airlines took the unglamorous crown as the airline with the worst customer satisfaction record. The low-cost carrier, headquartered in Miramar, Florida, which operates flights throughout the U.S., Caribbean, Mexico and Latin America, also had the worst on-time arrival rate for the month of June, with 50 percent. That was, however, down from 61 percent in May. Spirit blamed its poor performance on a tropical storm that swept through Texas that month.